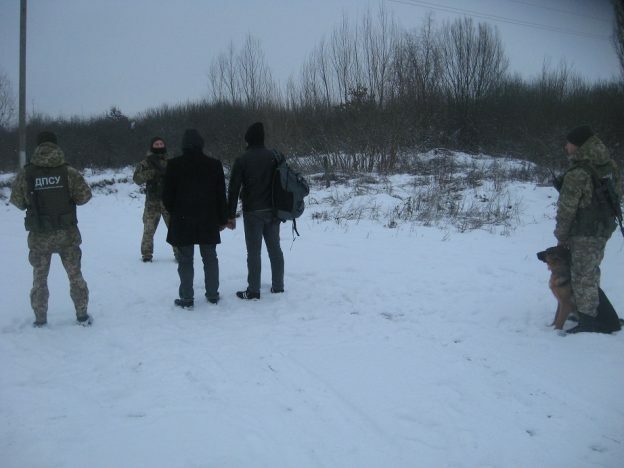 It was succeeded to detain the offenders due to expeditious exchange of information on identification of a group of persons by a border detail of BU “Vylok”, who moved towards the water channel “Botar” through which the Ukrainian-Hungarian border passes. As a result of further joint activities, the Hungarian border guards, from their part, were able to detain immediately four people without documents, who called themselves Turkish citizens. Another Turkish citizen, accompanied by the Ukrainian, was detained by the border guards of the Mukachevo Detachment according to the information received from the operational staff of the Western Regional Department. The foreigner was in the car driven by the citizen of Ukraine. Information about the detection and apprehension of illegal immigrants, as well as further possible attempt to breach the border on other directions was distributed along the neighboring border units of Mukachevo Detachment. Checking this information, the response team of the BU “Luzhanka” together with the operational staff of the state border service soon detained two more Turkish citizens who planned to illegally enter Hungary. Currently, the detainees undergo filtration actions, all circumstances of the crime and a circle of persons involved in the organization of illegal transportation of citizens through border are established. This entry was posted in Translated Media-News from Ukraine on January 8, 2019 by oksana.